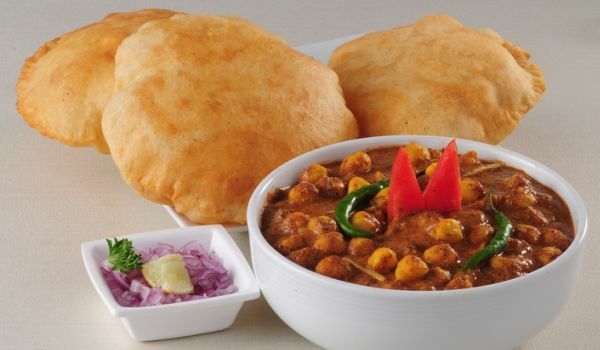 Chole Bhature is a mouthwatering recipe. Learn how to prepare Chole Bhature by following this easy recipe. Mix all the other ingredients and add the yeast. Make soft dough out of it and roll out small balls from it as per to your requirement. Spread the rolls in circular direction like chapattis. Place the utensil over a medium heat stove and place the rolled out chapattis that will become large like poori. Put it aside when the poori becomes golden brown. Over medium heat flame place the pressure cooker and pour oil into it. Stir fry the garlic and cumin seeds for two minutes. To it now stir fry the cloves, bay leaves and diced onions light brown. Apart from cilantro and mint leaves add the rest of ingredients then stir fry it for two minutes. Add water and allow it to boil for three minutes. Lower the flame and close the lid with gasket. Raise the flame and after 3 whistles remove the cooker from the flame. Once it becomes cool pour the chole to a bowl then garnish it with cilantro and mint leaves. Best serve it with roomali roti, paratha, rice and naan.